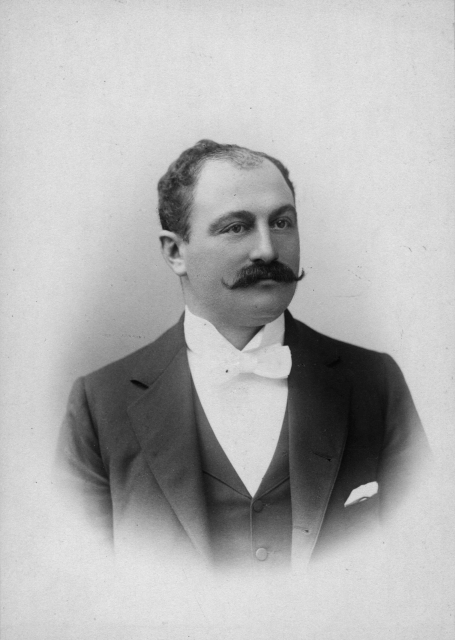 Rabbi Michael G. Solomon was born in 1868, in Pusen Province, a Polish area then under control of Prussia. He came to America with his parents as a young man, attending City College in New York City, then the University of Cincinnati and Hebrew Union College in Cincinnati at the same time. He graduated from both schools in 1893. After spending two years at a Youngstown, Ohio pulpit, he was invited to Los Angeles to fill the pulpit of Congregation B’nai B’rith (now Wilshire Boulevard Temple), as successor to Rabbi Abraham Blum. Rabbi Solomon was rabbi when the congregation had closed its old building, was meeting in rented halls, and was preparing to build a new synagogue structure. He joined the task and construction was completed in the autumn of 1896. The architect, Abraham M. Edelman, was the son of Rabbi Abraham W. Edelman, the first rabbi of the congregation. The synagogue’s president at the time of the cornerstone laying was Herman W. Hellman, and its watchful treasurer was Herman Silver. The new Congregation B’nai B’rith was designed, built, and furnished entirely by home talent and home materials – even the organ. Rabbi Solomon introduced the Union Prayer Book to the synagogue, bringing the services directly in line with the Reform movement. However, the congregation still refrained from officially joining the Union of American Hebrew Congregations. Rabbi Solomon concentrated heavily on Jewish education for the children. In doing so, he ran into his first problem. He expected equal opportunity and equal handling of all children regardless of their parents’ “status” in the congregation. This disturbed a number the the more “privileged families. 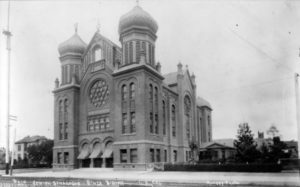 Even with the size of Los Angeles doubling during this period and the building of a new structure, the membership of the synagogue remained stagnant. Rabbi Solomon was re-elected for an additional two-year term. Toward the end of his third year, Solomon advised the board that he would not seek renewal. Leaving Congregation B’nai B’rith, Solomon served for a short time at an attempted new Reform synagogue in Los Angeles, but moved shortly thereafter to a pulpit in New Jersey. In 1903, Rabbi Solomon returned to California to study Law and was admitted to the Bar in Los Angeles. In 1904, he and Rabbi Edelman led High Holy Day services at the Elk’s Hall to a large attendance. In 1896 Rabbi Michael G. Solomon married Miriam Silverman, sister of Rabbi Joseph Silverman, a classmate from Hebrew Union College. Reva Clar and William M. Kramer, “Michael G. Solomon, 1868-1927L Rabbi and Lawyer of Los Angeles,” Western States Jewish Historical Quarterly 14/1, 38/3&4.